This B&H Kit includes the 788T-SSD 8-Input/12-Track Field Recorder and an ORCA OR-32 audio/mixer bag. 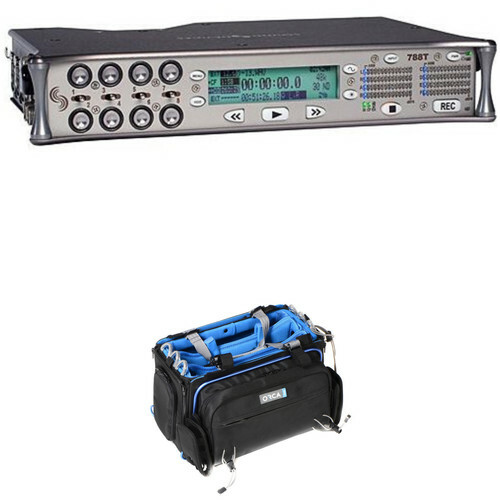 With 12-track recording at up to 24-bit / 192 kHz resolution, analog and digital I/O, timecode support, and customizable storage and transport methods, this kit is ideal for field recording and ENG, as well as TV/film/video production. The detachable handles and strap make this well suited for wearing over the shoulder. The Sound Devices 788T-SSD Portable Digital Recorder builds on the success of the Sound Devices 7-series digital recorders. The 788T-SSD is a lightweight and compact professional recorder that features 8 digital recording tracks. An internal 256GB SSD, CompactFlash media with UDMA support, external FireWire hard drive or DVD-RAM (with bus powering) all serve as compatible recordable media. Any or all of these options may be used to record audio simultaneously and the 788T-SSD serves as a mass storage device when connected to high-speed USB or FireWire ports on Windows and Mac OS X computers. The 8 microphone and line-level inputs are provided as 4 XLR and 4 TA3-male connections. The 788T-SSD has 8 channels of balanced AES3 digital input and 6 channels of balanced AES3 output for simple integration with compatible AES3 digital cameras and mixers. All of the 7-series feature still apply; including 48V phantom, limiter, polarity reverse, high-pass, selectable delay and headphone monitoring on each input. The OR-32 Audio / Mixer Bag from ORCA is designed to carry, protect, and enable access to your audio mixer. The bag's aluminum frame allows for access to the gear from six directions, and its bright blue polyester lining provides easy viewing of the equipment. The top clear TPU allows you to see your gear without opening the bag. The bag features two pockets for accessory storage, front bungee cords to hold a boom pole or cables, 2 external detachable pouches, and 9 rubber bands to support your wireless system. The rubber battery fittings secure your battery in place while the interior sliding system secures your gear. The bag also features detachable carrying handles and a shoulder strap and can be connected to the ORCA Harness for easier carrying. Please see manufacturer's site for a list of approved cards. Box Dimensions (LxWxH) 16.0 x 12.0 x 11.0"